The team over at Tom's Hardware have gotten their hands on Intel's new 'Kaby Lake' CPU - The Core i7-7700K. While the chip is not marked as an engineering sample, they cannot confirm with confidence that it is a retail part. They then did what we all hoped and expected, they put the new i7 through a series of benchmarks both at its stock speeds and overclocked. Without a retail Z270 series motherboard to test with, Kaby Lake compatible firmware was loaded onto their Gigabyte GA-Z170X-Ultra Gaming board. In line with what has been reported so far, the stock clock speeds of their sample was 4.20GHz base and 4.50GHz max turbo boost with a TDP of 95W, up marginally from the i7-6700K's 91W. 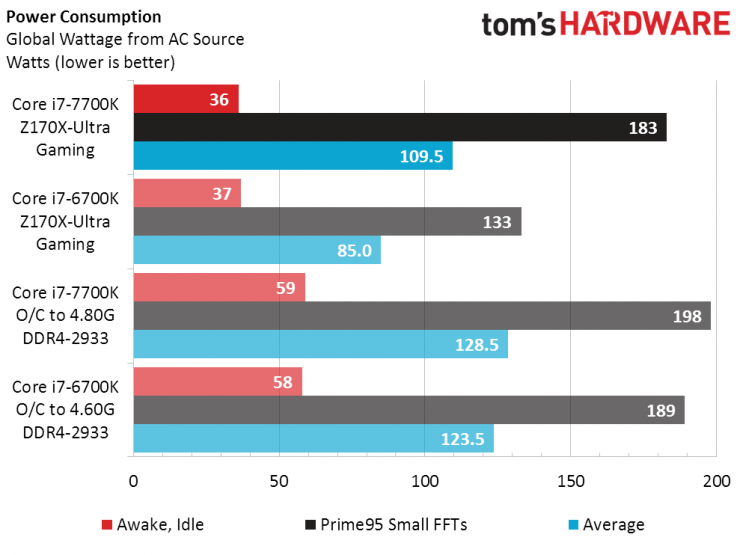 As tested the 7700K drew slightly more power under load than the 6700K whilst achieving benchmark results that are more-or-less in line with the percentage clock speed increase. Using the same core voltage for overclocking, the 7700K was able to manage a 4.8GHz overclock at 1.3v where the 6700K achieved 4.6GHz. As Intel did not change the core micro architecture between Skylake and Kaby Lake, it appears that save for HEVC and VP9 8/10-bit encode/decode and other possible features we may not yet know of, slightly faster clock speeds is the principal improvement. Given this is a pre-release test conducted on a motherboard that may not be able to unleash the full potential of the i7-7700K, the results should be taken with their appropriate pinch of salt. For the article and detailed findings, please follow the source link. My 4790K@4.5 benched skydiver between the stock 6700K and 7700K, meh. Not worth the time or money for a new build. Though a new chip at 4.8 does sound nice. Can't wait for Jan 2018 when the 8700K is released with 2% IPC gains over the 7700K. I would normally be impressed by a part sipping power like this at such a high clock, but really, I just want more cores (and not to be bent over for it like HEDT). 2% ??? are intel got us spoiled... +2% will be possible if they increase frequency by +5%. but lets be little serious about next 8-th gen, I think there will be a +10 up to +15% gains over 7-th gen.... in price tough. 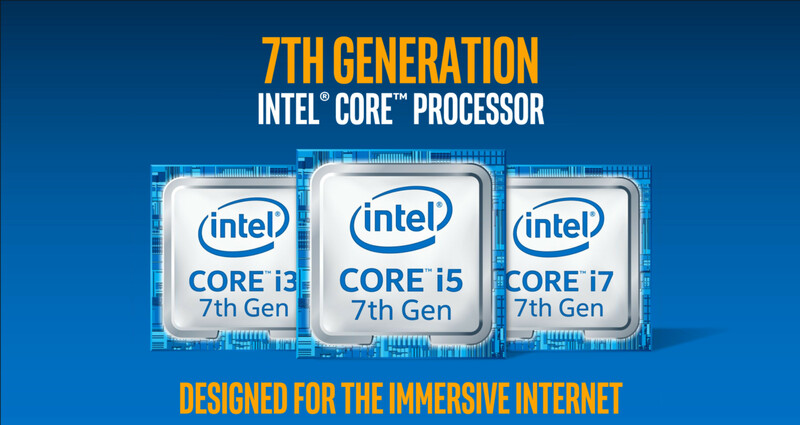 Tests carried out on Tom's Hardware have little realistic and more like the commercial for the new i7 7700K. In real terms, the processor is almost the same as i7 6700K. In view of the tests i7 7350K shown here and I was expecting a lot more. Maybe it's true that base board was not suitable. Is it finally time to upgrade my i7 3770K? No, overclock it. I just bump my CPU clocks by 200MHz with each new gen release and results are the same as after spending 430 euros :D Heck, now even power consumption got similar. Once new motherboards are released and their BIOS reviewed and updated, there should be an even greater increase. Considering that the frequency 200Hz differences in OC, the results of the 4.8 Gh accordingly higher... We will see how it will all shown on the Z270 chip set wen will be issued . Hmm. I wanted to upgrade to Kaby Lake regardless, not because of performance, but because of all the other features of the platform that would be an improvement over my otherwise fine Ivy Bridge-based PC, but reading all this I can't help but consider skipping this because I refuse to give Intel money for hardly any work done since previous generation of CPUs out of general principle. If a 5% increase in clock frequency yields a 2% increase in performance you get a lower IPC. Looking at the gains that the 7700k gives and the power consumption the 6700 K seems to be a better option. I doubt it. The chipset, at least on paper, has hardly any changes vs z170. From a power consumption perspective, yeah. Kaby does seem to overclock better than my Skylake samples I've toyed with though, if this test represents the norm. Hey, at least we only need to upgrade CPUs every 4-5 years now... if AMD was competitive, maybe things would be different. Toms retested with an MSI board. It seems like this chip will need a delid or a really good cooler. 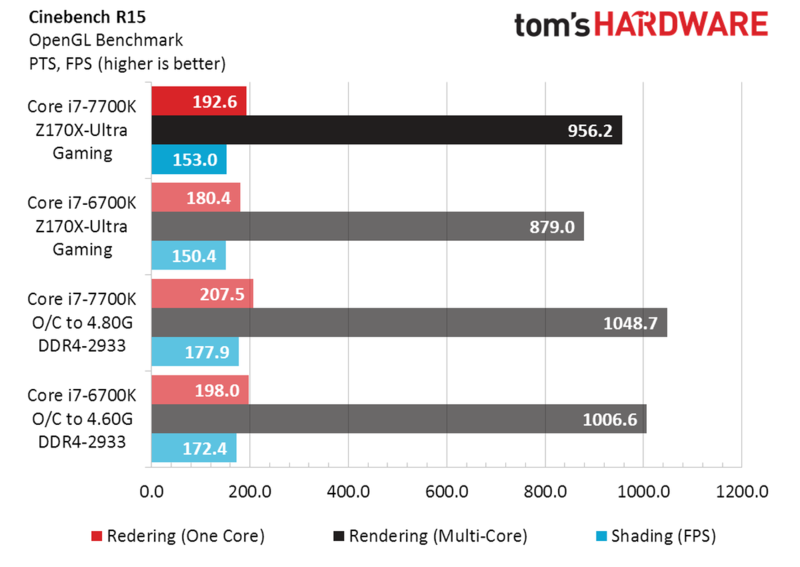 A guy over at anandtech got something similar though, so it seems like the 7700k will handle high 4s to a 5Ghz OC pretty well, if you're comfortable with a voltage that's pretty high.